Eskimo Clark, whose real name is Paul Clark, is a professional poker player with a birthday of June 2. Very little is known about Paul Clark away from the poker table. He served as a medic in the Vietnam War and is originally from New Orleans, not Alaska as a lot of people assume. Paul Clark got his nickname of Eskimo for his looks, which slightly resemble the logo of Alaskan Airlines. Paul Clark’s first major success at the poker table was at the 1988 World Series of Poker when he finished in the money at the limit Omaha event. 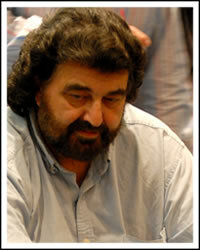 Paul Clark cashed twice at the WSOP Main Event with a 19th place finish in 1997 and a 25th place finish in 1998. Paul Clark does have three World Series of Poker bracelets. He won the 1992 $5000 Seven Card Stud event, the 1999 $1500 Razz event and the 2002 $1500 Seven Card Stud Hi-Lo event. Paul Clark has also placed in the money four times at the World Poker Tour, including a second place finish in the World Poker Challenge $5000 No Limit Holdem event. Paul Clark has won more than $2.5 million in poker tournament winnings. He currently resides in Las Vegas, Nevada.